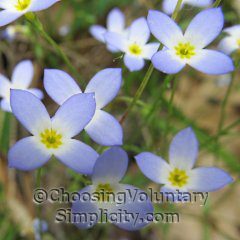 Bluets (Houstonia caerulea), or Quaker Ladies as they are sometimes called, are one of the smallest and daintiest wildflowers that we have in New England. 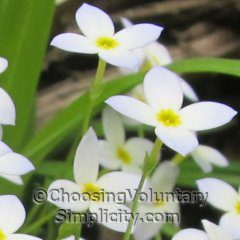 It is easy to overlook bluets because they are so small… the entire plant is only five or six inches high and is often hidden by taller plants or grass. Small leaves appear in pairs along the length of the stem. Larger basal leaves are clustered at the base of the plant. Each tiny flower measures only about three-eights of an inch across, has four petals and a bright yellow center, and is held at the end of a very slender stem. The petals may be shades of blue or pale lavender or even all white, and some of the petals may be outlined with a dark blue. 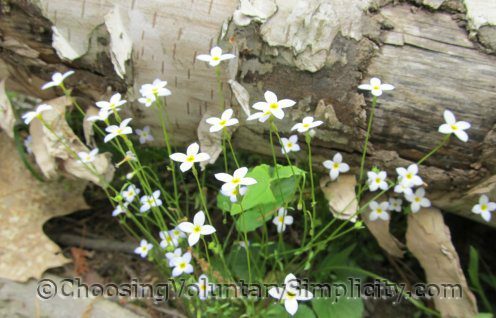 … and sometimes in open, sunny areas in the woods there will be massive clumps of bluets growing so thickly together that from a distance they look like a light covering of snow. These are so pretty and so delicate too. I remember seeing these when we used to live in New England. Ours were always white with a little bit of lavender. I really love the blue ones in your photo. I have learned so much from your wildflower posts and also the photos. I have a small book on New England wildflowers but it only has drawings and I find your photos so helpful. Just wanted to say thanks. Is it possible that this is the same plant that is sometimes called ‘innocence’? I spent my childhood in Maine and I think I remember seeing a lot of these but the name is different. I just talked to my Mom and she said she thinks they are the same so I thought I would ask. I haven’t commented before but I am a regular reader and I really enjoy your blog. Mollie, we’ve only ever just called these wildflowers bluets or Quaker ladies, but I have seen the name innocence used for them as well in gardening and wildflower books. Quaker Ladies have long been a favorite flower of mine So gentle and sweet! 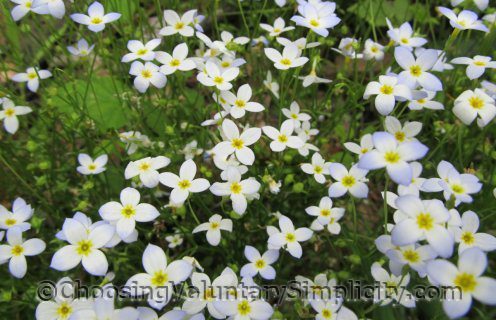 I grew up in central Massachusetts and these are called ‘Forget Me Nots’….